There are many different ways to bait up using boilies. Specimen anglers make use of spods, bait boats, catapults (fancy word for a "good' ol" ‘kettie’), baiting poles and even throw boilies into the margin by hand. In this post, I will be focussing on my favourite method: the throwing stick. Confidence is key when it comes to fishing. I’m a firm believer that you have to stick to what works for you. However, trying out new tactics and rigs; and deciding to incorporate it into your fishing or not; is how we evolve and become better anglers. Below is my take on things. There are hundreds of ways to bait up and catch carp. I just hope by sharing some of my findings, tactics and experiences; it’ll give you something to ponder over, and who knows; maybe even incorporate into your own fishing. First and foremost, I have to say, it’s not just about piling in bait. Throwing kg after kg into your swim and expecting to catch loads of carp isn’t what baiting up is all about. You can easily ruin your chances (even your whole session) through excessive feeding. Therefore, one has to be particularly thoughtful. Where am I fishing and for how long? Location. Location. Location. I like to do my research before a session, and try to find out what stock of fish the water holds. This gives me a good idea of the tactics I’ll want to employ and how much bait to take with on the session. When fishing for the day only (I’m always looking for a quick bite); and like to put 20 or so boilies out over each rod with the throwing stick. This approach has proven lethal at the current day-ticket venue I’m targeting; producing carp up to 30lbs within one hour after casting out at a notoriously difficult water. My thinking being that when I’m fishing ‘wild’ day-ticket venues; I’m only fishing for six to eight hours, and obviously want to catch carp, quickly. Therefore, in 90 percent of my day-ticket fishing; I want my hookbait to stand out. By making my hookbait ‘special’ through adding buoyancy, glug, colour, etc. to it; I believe it helps carp to hone in on it. And in the end; hopefully, get me quicker bites. With little bait out in a concentrated area, I’m hoping to increase my chances of a pick-up. What’s the point of putting out loads of bait and the carp enjoying all those freebies when I’m just looking for a quick bite? On the other hand, If I’m planning a long (three to five day plus) session; I’d be more inclined to put quite a bit of bait out from the get-go. Set my stall up (so to speak); seeing that I know I’ll be fishing for a lengthy period and want to draw the fish into my swim (and most importantly, keep them there). If it’s cold (e.g. Winter), fish won’t be extremely active because of low water temperatures. Low water temperatures mean slow metabolism for the fish – so I don’t bait up with loads. I’ll rather try fooling them with a few trusty old ‘mousetraps’. On the other hand – if it’s warm (e.g. Summer), then the fish will generally be more active. An increase in water temperature means the fish will maintain a higher or faster metabolism. That’s why I put a bit more bait out than what I would in the colder months. A change in weather and water temperature induces most fish to spawn. Knowing when carp spawn at a particular venue is a great insight that will help you determine how much bait to use on a session. How should I bait up? This comes down to personal preference and what’s comfortable for you. However, using a throwing stick for the first time can take some getting used to. Don’t become despondent if bait initially lands in front of your feet or rockets straight up into the air. We’ve all been there. 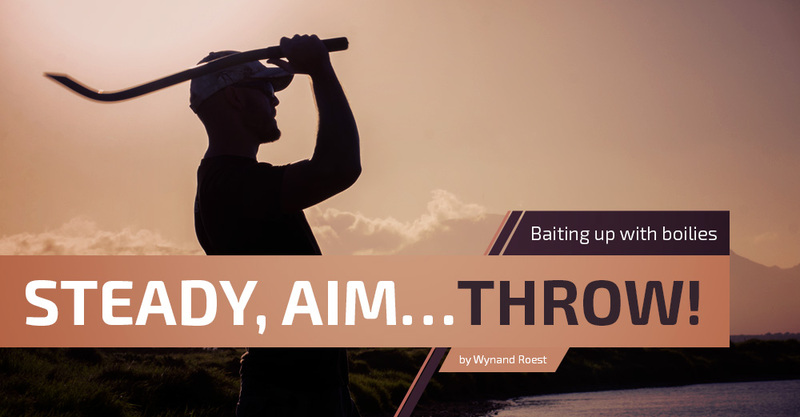 Keep practicing, and you’ll be able to get those boilies bang on your spot in no time! Stance: Like a cast – starting off with my weight on my front foot, leaning back – letting my weight transfer onto my back foot, before propelling forward. Aim: By locating a visual marker (e.g. a tree on the opposite bank) that’s in line with my spot, and having something to aim for, makes it easier when baiting up tight. Alternatively, I’ll locate two trees (or two objects) that are some distance apart on the opposite bank if I want to create a spread or larger baited area. When boilies split in mid air – simply wet the tip of the stick by dipping it into the dam or river that you’re fishing. This will help reduce the backspin. And if you’re really giving it stick (pun intended) and still coming up short of your spot; try only throwing one boilie at a time. When should I bait up?